How do common woodpeckers avoid essentially a shaken brain syndrome? In a previous essay I had described how woodpeckers avoided concussions with their rapid fire 20 times a second at 1200 g occurring each impact behavior with a tightly packed brain. This essay will provide more specialized detail about how woodpeckers accomplish protecting their brain. I am citing from a recent PLoS ONE open access report from October 2011 Volume 6 Issue 10 entitled Why Do Woodpeckers resist head Impact Injury: A Biomechanical Investigation authored by Lizhen Wang, Jason Tak-Man Cheung, Fang Pu, Deyu Li, Ming Zhang, and Yubo Fan. As a researcher for concussions at one point you ask yourself: Does anything in Nature exist that has adapted to what we observe with each head deceleration incident as a component of the repertoire of a mammals normal behavior, in terms of avoiding concussions? In this aspect the woodpeckers has evolved its own specialized helmet of sorts to avoid all the pitfalls affecting us humans smacking our heads against immoveable objects. Lets see how these amazing birds accomplish this kind of brain protection. As i have mentioned before, their brains are tightly fitted into their bony skulls with little cerebral spinal fluid filling between brain and head bone. The authors describe also a specialized bony structure, getting into a lot of detail of the absorption capacity within the head bone anatomy within the trabeculae, the small struts of connection. The authors break the various bone parameters down into bone volume fraction, structural model index, trabecular thickness, trabecular number, trabecular separation and bone mineral density using actual micro computerized tomography of the woodpeckers skull bone. The authors then cleaned up the skull specimens while they dehydrated the skull bone, then sprayed a micro 20 nm thick layered coating of gold. Then they scanned these bony head sections with an electron scanning microscope to visualize the specialized detail within the micro structures of the head bone. The authors wanted to replicate as close as they could the dynamic response of the woodpeckers head by creating a computer simulated model of the structural characteristics by employing specific mathematical finite element 3-Dimensional representation of the woodpeckers head. They could then simulate the woodpecker head strike impact in terms of revealing the strain within a very accurate anatomical detail developed from the scanning electron microscopy images. They also specifically designated the material properties, things like compression resistence, deformability, destuctive testing to the point of collapse involving the woodpeckers skull, beak and the specific very specialized hyoid bone within the beak. Some of the interesting findings discovered by the authors were observed from their ability to vary the length of each beak, seeing an especially low concussion effect when the lower beak is longer than the upper beak, which is the real way it is in life. Their worst scenario for impact force occurred when both bones of the beak were the same length bringing greater strain into the brain itself in simulation strikes. Their analysis confirmed that the longer lower beak hits first then transmitting toward the cartilaginous transition where the beak joins the head case, by slightly deflecting at this junction between the beak attachment to divert the force downward probably into the woodpeckers neck to load the upper torso with this particular application of the striking force, lowering the brain strain at the same time. The authors measured the resultant bone load to be concentrated around the eye orbit bone after the initial striking of the beak. The authors also observed that the eyes closed before each beak strike. So what is special about the Dryocopus pileatus, the common woodpecker? Their combination of design evolution adaptations have come with the evolution of their pecking activities to reduce the overall impact into the brain employing these very specialized anatomical configurations to spread away strain loads from the head bony cavity. It must be highlighted that the woodpecker strikes in only a specific direction so that all the evolutionary adaptations are directed against this specific vector direction strike. The woodpeckers also do not appear to have any brain rotation consequences with head strikes. What if a woodpecker were to be hit in the head, say backwards, would the bird still be able to resist the impact as concussion producing, I would venture probably no since no specialized deflection design is available. What do you think? 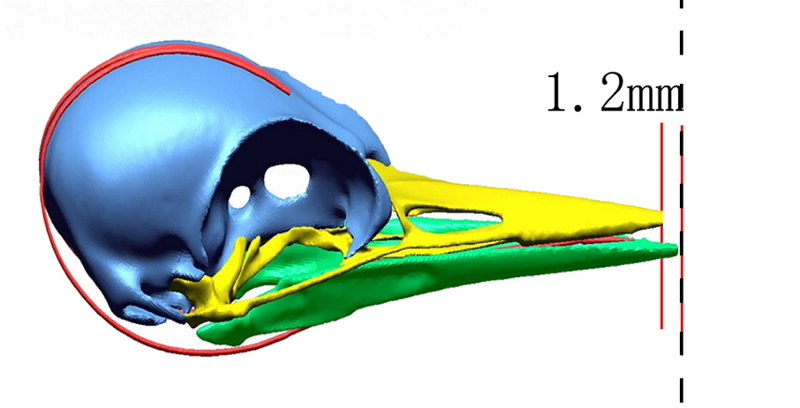 As the simulation force of a head strike impacts first contact with the lower beak the red colored high strain/fringe level zone can be seen curling around the bottom portion of the skull bone in effect leading away the force from the interior, providing dispersion away from the brain. I believe Nature is showing us how to effectively disperse force strain away from the woodpeckers brain, avoiding a shaken brain completely. Its now up to some great engineering innovation to adapt this kind of dispersion strategy toward shedding fringe strain into human heads no matter what impact vector direction comes from as a better way to protect massive brain deceleration. Outstanding job on the articles; you seem to know your stuff. would like to ask nevertheless… where did you acquire this theme from? I’d personally love to make use of it on my site if at all possible. Thanks a lot!